Includes the names: ミル, J.S. Mill, J. S. Mill, Mill J. S., J.S.ミル, J.S. ミル, STUART MILL, Stuart Mill, John S. Mill, John S. Mill ... (see complete list), John St. Mill, J. Stuart Mill, John Stuart Mll, ohn Stuart Mill, John Stuart Mill, John Stuart Mill, John Stuart Mills, John Stuart Mills, John Stewart Mill, JOHN STUART; H MILL, John Stuart Mill Mill, Džons Stjuarts Mills, ג'ון סטיוארט מיל, ג'ון סטיוארט מיל, Stefan (editor) John Stuart; Collini Mill, Alburey (editor) John Stuart; Castell Mill, Wendell Robert John Stuart; Carr Mill, Intro. 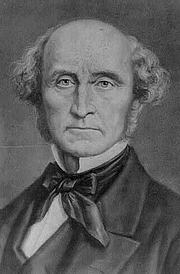 John Stuart Mill was one of the 19th century's most influential political and moral philosophers. He was a strong advocate of freedom of speech, freedom of thought, and the rights of women. John Stuart Mill is currently considered a "single author." If one or more works are by a distinct, homonymous authors, go ahead and split the author. John Stuart Mill is composed of 28 names. You can examine and separate out names.